The intercoms on the Red/Purple Line subway are usually located next to ADA seating area by the doors. 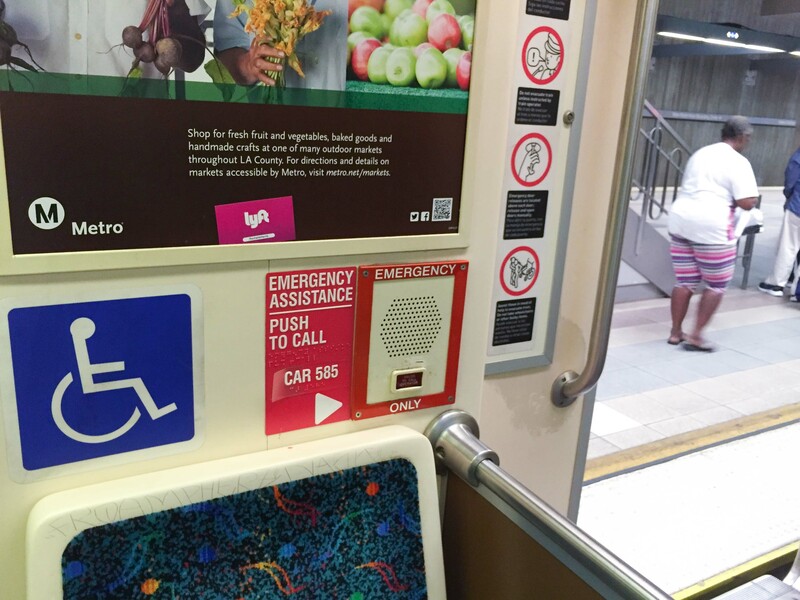 Each Metro Rail platform also has emergency intercoms, indicated by red signs. Of course, we welcome any feedback on how transit trips can be improved and the team does its best to respond to questions directly or pass along the feedback to the proper staff. But when it comes to safety and security, I want to remind everyone that Twitter is not the best platform for reporting these type of issues. If you ever encounter or witness a situation that you feel is dangerous or makes you feel unsafe, please call the Los Angeles Sheriffs Department right away at 888.950.7233. If it’s an emergency, just dial 9-1-1. You can also alert Metro staff to incidents by using the train intercom or station intercoms marked by red signs on station platforms. If you’re not able to report a crime immediately, try to get to a safe location and then make the call. I know most people don’t want to draw attention to themselves when faced with a potentially threatening situation, but at this time these are the fastest and best options to directly reach the people who can respond and help. You can also report to LASD anonymously and upload photos or video with the Transit Watch app. I definitely encourage you to use this method if it’s a non-emergency and you want to show a quality-of-life issue. Even if you think the incident wasn’t that serious, if it’s something that concerned you or made your commute uncomfortable, LASD wants to know about it. They can adjust their patrols based on your feedback to better monitor potential problem areas. Please keep in mind our Twitter feeds are not staffed 24/7, and LASD does not take incident reports on social media. We do our best to assist when we’re able, but we need your help to keep the system safe and secure. I recall sending my first SMS in 1999, although not in the USA. I used text messaging to alert (and correspond with) RTD security to an issue when I visited Denver earlier this year. There are often situations where using voice communication to report an incident is either impossible or dangerous. Can you tell us why it is still not possible to send a text message to either Metro Security or to LASD Transit Policoing? Photos and video can be attached to text messages. It’s the second half of 2016. Currently that ‘Transit Watch’ web site is totally focused on terrorism; reporting other issues like fare avoidance, rampant panhandling, onboard selling, sexual harassment, etc is very deemphasized. Content must have been created by LASD after being pumped up by a DHS training session or maybe just binge watching the ‘fear based’ cable news channel. “If you see something, say something”. Yes, I would definitely report it if I saw an abandoned briefcase with wires hanging out of it or something, but I’m pretty sure that most of us would do that anyway. In my opinion, the LASD/Metro campaign against sexual harassment is far more important, as men making unwanted advances towards women traveling alone is both far more common and far less likely to be reported than anything involving terrorism. I’ve been riding the Expo Line since it opened in 2012. The only actual crimes that I’ve witnessed are two iPhone thefts. In both cases the “perp” grabbed the iPhone whil the door to the train was open at a station and sprinted off the train. By the time the victims got over their shock and screamed for help the doors were already closing. What is the proper response in this case? Should the victim call 911 or the sheriff? Should she hit the emergency intercom and tell the train operator to stop the train? Thanks. 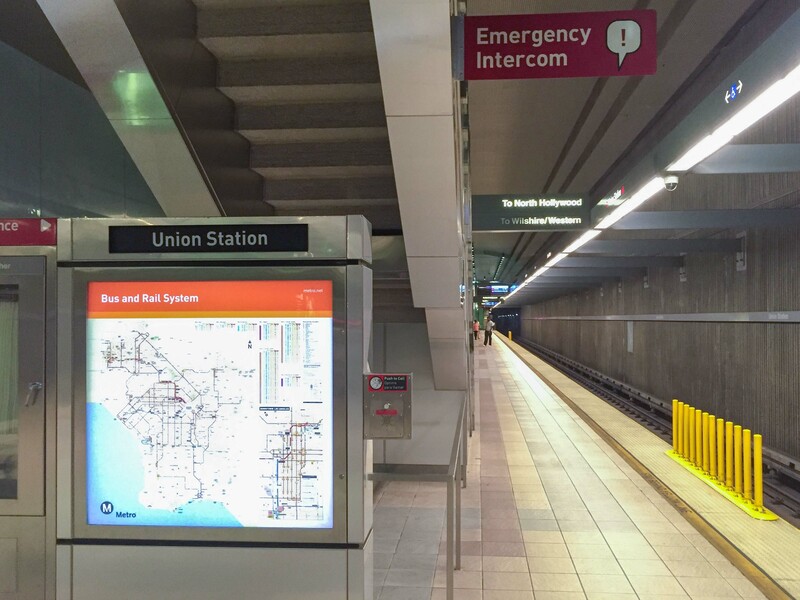 While the operator may not be able to stop the train, you should still use intercom to report the incident to the operator, or follow up by reporting to LASD directly. If it’s reported, they will be able to pull footage from security cameras to investigate. I saw a man with tools trying to break a lock and steal a bike at Wilshire/Western station. I called the Sheriffs 888 safe # and they said “yea yea ok” I was going into the station and the thief went down there as well. I took photos and followed him to 7th st and I went all around the station trying to find a cop and of course no cops to be found. I went upstairs and called the Sheriffs again…” oh yea we will send someone” What a bunch of garbage. I “saw something” I “said something” and nothing happens. Maybe if I called and said “theres a scary brown person with a backpack” they would have sent 10 helicopters and 50 SWAT teams. I’ve tried using your advice, but the transit watch app is wildly ineffective. I’ve had people blasting music from the back of the bus. Rather than confront the person with the boom box, the bus driver told Metro Police that there was no incident. My ticket was closed, and the music continued to play. Reports to Metro Customer Service and Metro Ethics were met with silence. When I witness a security issue, I often see Metro staff nearby. They don’t report anything to the sheriffs. Heck, I’ll press the red ‘assistance’ button at stations to report maintenance and security issues, and the staff on the other end are often dumbstruck. There’s follow-through is inconsistent, at best. I’ve uploaded a report using the TW app when somebody brought their dog, without a leash, on board the Expo line (once I got service at Pico station). They had boarded underground at 7th/Metro, in full view of the Metro team! Fourty minutes later, as the train would have arrived at the final stop, my ticket is closed – there’s nobody left on the train so the incident was over. A few years ago, an audit caught the Sheriff’s Office billing Metro for staff that had not even been hired. Those were transferred to work for Metro were on unofficial probation. Working with Metro was seen as a punishment, and we got officers from the bottom of the barrel. Metro is still unable to control the sheriffs, and the sheriffs are still unwilling to work.